Seems like the overall golf industry and the education conference and tradeshow for superintendents that bears its name are joined at the hip. Both are unable to match pre-recession participation numbers and both are struggling to find ways to boost interest in what appears to be a declining model. Attendance at this year's Golf Industry Show in San Diego came in at about 11,900 with 5,950 qualified buyers. That's about 200 more attendees and 500 or so additional qualified buyers compared with last year's mid-America show in San Antonio, which in two attempts has been pretty much a total bust - at least as far as numbers go. That attendance figure is about 500 behind the five-year average of 12,440 that includes two shows in San Diego (2019, 2016), two in San Antonio (2018, 2015) and one in Orlando (2017). Long walkways make the layout at the San Diego Convention Center appear deceptively large. To that end, the 510 vendors who exhibited at the show were 21 less than last year, 40 behind the 2017 show in Orlando and easily the fewest since the current GIS model was implemented in 2005 in Florida. The last time the GIS was in San Diego in 2016, 550 vendors rented out 250,000 square feet of exhibit space in the convention center. This year's show fell short of that number by nearly 42,000 square feet, or about 16 average sized U.S. houses. That said, exhibit space this year was up from last year's 184,400 square feet in San Antonio. The all-time low for exhibit space in the GIS era was 172,900 in 2013 in San Diego. The all-time high was 2008 in Orlando when the combined show that included the Club Managers Association of America attracted 965 vendors covering 300,900 square feet of booth space. To be clear, that was a different show in a different era, and, like pre-recession golf, we're never going back there. The show does typically receive a bump when it travels through Orlando, and next year's show could get a big boost by a schedule change that has it running back-to-back in late January immediately following the annual PGA Merchandise Show. Word on the street is that since two large tradeshows are running in succession the next installment of GIS might be moved across International Drive to the North/South Concourse of the Orange County Convention Center and away from its traditional home in the West Concourse. 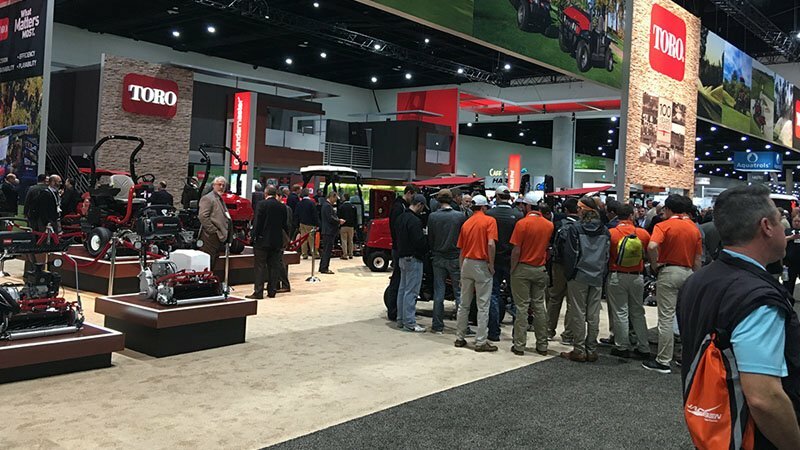 Whether butting up to the PGA Show was intentional or not, it's a move that is long overdue and kudos to the GCSAA hierarchy for trying something different to boost attendance as well as cut down travel expenses for the select vendors who exhibit at both shows. The following year's show in 2021 will return to Las Vegas for the first time since 2012. That show was considered a dud when compared to some of the old line shows of Orlando and New Orleans. Today, however, numbers like 14,700 attendees, 7,000 qualified buyers and 540 vendors sound pretty good. What the show holds after that is anyone's guess. A site has not been announced for 2022, which would be the traditional San Diego slot. What we do know is that sky-high hotel rates and a city ill-equipped to deal with its homeless population is not a good match for an industry trying to find its way in a shrinking market.